Rigabamboo here with the best of the AJATT+ forum. Okay, great. I have good news for you. You’re going to play DDR. I’m going to help you be really good at DDR. Here, get on the machine. You can even pick the song. And the difficulty. It doesn’t matter. Just pick something. Okay, good. Now you’re playing DDR. You’re having fun, right? Because you like DDR? Now… don’t stop for five hours. You want to get good at this, right? Well, to do that you should play a lot. More effort = more betterness, right? I can see you’re in pain. That’s good. Just push through that pain. What’s that? You’re tired? Too bad. This is important. You should play DDR. What? You don’t like DDR anymore? You’re quitting? You don’t want to play DDR ever again? I freaking love DDR. 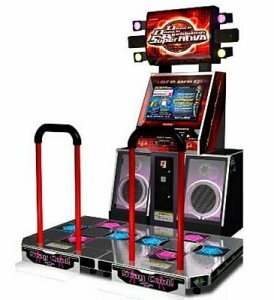 I love dancing to the music in DDR, much like I love the content of my srs. If I were to force myself to without variation, play DDR for 5 hours every day, I would grow to hate DDR, despite the fact that the content of the game is really fun. I would also be physically exhausted, and unable to have fun playing DDR under those conditions, just as having high daily expectations of srsing everyday would mentally exhaust me, even though the contents of my srs deck is fun. Oh, right! Thanks アンソニー. Learning Japanese should be like playing DDR, or whatever your addiction of choice is. If you force yourself to do it, for hours and hours, you’re going to hate it. But if you do it whenever you feel like it, and you quit when you want to, you’ll not only love life more, but you’ll see more improvement. Because you’ll keep going back to the game. Trying too hard = pain = burn out = no improvement. Treating Japanese like your favorite video game = fun = keep doing it = becoming awesome. Always keep the Japanese going (I wish there was a catchy way to say that… like AKTJG or something… hmm, maybe it’ll come to me later), but don’t always be exerting effort. Don’t make your SRS own your whole day, or even more than an hour. Don’t do the same stuff. Give yourself variety. Just, please…. don’t make video games a chore. I find that I can only do maybe 20 srs a day. What can I say? I love it at first, but after that it feels like homework. So I just stop and move on to something else, like reading my children’s books or my (free) ipod touch ebooks. Then I can go on my kanji learning video game and play that for a while. I started sentence mining after about 1000 kanji instead of waiting to learn them all; I don’t like to keep waiting and with 1000 kanji I can still read my elementary school-targeted books and the sanseido dictionary with little problem. Hence why I’m still playing a game to learn the rest (about 1400 kanji learned now, ’bout 700 more to go). Worse comes to worse, I can listen to (japanese) music. Don’t get me wrong, part of me keeps saying “KEEP SRS-ING, you’ll never get there!” but I’m learning to ignore that. I’m very much prone to 3day monk and those other learning no-nos, so I have to be careful not to fall into my old habits back when I used to study japanese for 10 hours a day for a week- and then “take a break” for 6 months! I used to be uber at SRSing. I was going through hundreds of flashcards a day (about 200 word reps, 100+ sentence reps, not including ones only added that day) and I didn’t tire of it. This is because whenever I felt I didn’t want to do it, I thought about what I did want to do. I didn’t have an answer, didn’t feel like doing anything particular. So I’d just go ahead and do SRS reps until I felt like doing something else. SRSing is usually like procrastinating for me. Whenever I can’t think of what to do, I just go through some flashcards. If I really don’t feel like doing that anymore, I might watch some Mandarin TV. Basically, it’s like doing nothing. For a time I felt too tired to do anything and would sit around thinking I’m too tired, I’ll just wait until I feel more enthusiastic and actually want to do something… wouldn’t happen. So I decided I would just keeping doing regardless; if I felt like doing nothing, I would do nothing in Chinese. Anyhow, I went against Khatz’s advice and added quite a few long sentences, so recently my SRS has started to become a bit of a drag. The word cards I can go through in no time, but the sentences are so long it feels like they take forever to get through sometimes; I keep finding myself thinking that time could be spent reading books, manga, watching movies, goofing off – and here I am doing drills like a smuck! So today I’m laying off the flashcards. I’ll want to do them again soon enough. If I don’t, they are getting deleted. If I need them, I’ll add them later. What’s the rush? My general rule for sentences is to try to enter sentences that can be read in less than 6 seconds. (For example, 年が明けてから一向に安くなる気配がありません。 – from a blog entry remarking on the high price of leafy green vegetables. This is a good length in my experience.) I have a few longer ones, but they have to be really worth it, otherwise it’s not fun. You can break bigger ones up if you know where to do it, which is easy once you start to get used to the grammar. Here’s a free RTK 1 Word poster available for those of you who are too poor or impatient to buy the real thing. RTK 3 Word Poster for those of you who already finished RTK1! Anyway, it’s always fun for me to recognize something while doing SRS, but it always gets depressing when I have absolutely no idea what I’m looking at several cards in a row, so that’s when I stop. Hopefully, in a couple of months, I’ll know enough kanji to start reading (with a dictionary of course) and start reaping the rewards of repetition. Honestly, for me it’s hard to do a lot at once unless I really like it, for example, I could read for more than 24 hours with the only thing stopping me being the need for sleep. Other than that, I’m overly prone to being a three day monk (I’d three day monk with life if it were possible) so this is definitely good advice for me. podcastrank.jp/ May help with finding science themed podcasts. If you don’t have them already, more sciency stuff to read. What I’m doing now is looking for sentences that don’t need to be there – sentence structures that don’t especially need to be worked on, but that have useful vocabulary; then I delete the sentence and simply add the word. So, in the beginning at least, I recommend only using word cards for objective things like names of objects, places, creatures, etc For labels, basically. You will need sentences to associate subjective words with the right context, or you won’t really understand it. How long should I be playing the games a day? Because fitting this in with school/homework/etc. could be hard. Just keep Japanese audio on whenever you’re at home or in transit, and maybe even try to squeeze a bit into your school day. Do Japanese anything during homework breaks. Do Japanese anything when you finish your homework. Also have Japanese on in the background when doing non-homework stuff on the computer, like gaming ^_^. Most games have a seperate volume control for just the music, so if you turn it off, you can have Japanese music playing in the background while still hearing the sfx (in most cases, the game must be in windowed mode, so if it’s fullscreen you won’t hear the music from the other window). Just be careful about it if you’re playing a game that has voice chat (like Counter-Strike: Source). Sometimes, the Line In (microphone) and Stereo Mix (speakers) lines can get mixed up by the system, so instead of the others hearing your warnings about the spawncampers, they hear Japan-A-Radio at max volume (Source Engine games have had an issue lately where the outbound audio level (“Voice Transmit Volume”) is stuck at 100% even if you’ve disabled voice chat entirely).